Okay, so you are fed up of betting the usual way and you fancy trying something different. Betfair Australia, the nation’s first and only betting exchange, allows you to cut out the middle man and take on your fellow punters. Not only can you place bets to win, you can also lay bets to lose, and this facility has revolutionised the way people bet around the world. If you take your gambling seriously, then Betfair Australia is well worth checking out. Odds are usually a lot more generous than you will find with most Sportsbooks. *Commission rates may vary see terms and conditions. Betfair, the world’s first and biggest betting exchange, was launched back in 2000 by Andrew Black and Edward Wray. The Australian version was launched in 2005 in collaboration with Crown Leisure with a Tasmanian Licence. In 2014, Betfair Europe sold their 50% stake in Betfair Australia to Crown Leisure for $10 million, and they now own the exchange fully. Betfair Australia remains the only betting exchange in the country and it allows punters to lay selections to lose, as well as backing to win. Betfair Australia facilitate the transaction and they make their money by charging a usual commission of 5% on all winning bets. Although some may be slightly intimidated by this different style of betting it is well worth persevering with, as the odds on offer often dwarf those available from conventional bookies. The big advantage that Betfair Australia holds over its market rivals are the generous odds available. They cover all of the biggest sports, including horse racing, AFL, NRL, cricket, tennis, greyhound racing and lots more. More often than not, the best odds available on any given event will be biggest on Betfair Australia. Most bookmakers usually have an over round of between 104% and 108% on the majority of sports markets. To illustrate, here is an example of the difference between Betfair Australia and the rest. For the upcoming NFL SuperBowl, New England can be backed at 1.55 and Philadelphia at 2.8 with Betfair Australia. That translates as an over round of just over 100%. With SportsBet that over round is over 104%, a significant difference. The margin is even bigger for horse racing. As their distinct lack of promotions for existing customers show, Betfair Australia rely heavily on the strength of their odds to attract punters. However, it is a massive positive to have the biggest odds around, as it maximises potential winnings. Even after the usual 5% commission is taken into account, the odds on Betfair Australia ensure you will usually win bigger than you would with any of their competitors. The clean and easy to use desktop site! Betfair Australia Exchange Plus Web App: Live Betting On Racing! One of the key features that helps Betfair Australia’s web-app stand out from the crowd is the ability to place in running bets on horse racing online. This includes all Australian, (excluding Victorian jumps), New Zealand and selected International horse races. If you love to bet on The Melbourne Cup, you can do that with Betfair Australia. They also offer in play odds on lots of other sports that you can avail of by picking up the phone. 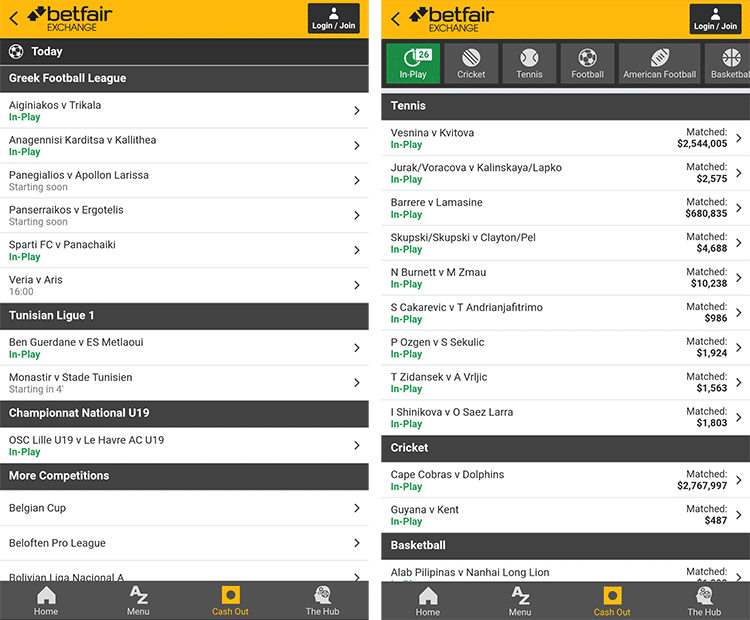 No matter what device you are using, including iPhone/iPad, Android, Windows Phone or Blackberry, you can easily access the Betfair Australia Web App. The new look Betfair Australia Web App was introduced in December 2016. Updated features include the ability to set a default stake, a faster odds refresh rate and an adjustable liquidity slider. A handy ‘Search’ function allows you to find your favoured bet with the minimum of effort, and you can also ‘Cash Out’ while on the move with the Betfair Australia Web App. We go into more detail on the cashing out function below. 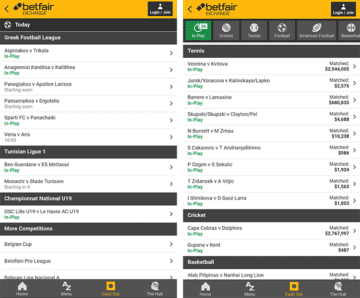 The new look Betfair Australia Exchange Plus Web App is certainly a big improvement on their old offering. If you like to bet on the move, you will find all you need with Betfair Australia. The Betfair Australia Mobile App includis inplay betting on racing! You can also cash out your bets early with Betfair Australia. One of the big advantages of betting on an exchange is the ability to profit on the fluctuation of prices. If you place a ‘back’ bet on the Betfair Exchange and the price shortens, you can then ‘lay’ at the shorter price and guarantee a profit. To save you going to the trouble of going through all that, Betfair Australia has a Cash Out facility that does all the maths for you. The cash out offer is constantly refreshed to offer you the maximum profit on the current prices available in the back and lay markets. When you punt with Betfair Australia, sometimes you don’t even need to back a winner to make a profit! Horse racing is a sport that Australians are passionate about. It is one of the most attended sports in the country every year and it is also one of the most popular sports for betting on. Betfair Australia’s horse racing product is all about the odds and the ability to lay horses to lose, and if you love value then you will enjoy backing horses on the exchange with Betfair Australia. There are loads of ways to back horses with Betfair Australia, including win, place, each way, match betting and forecast/reverse forecast betting. If there is a strong favourite in the race, sometimes Betfair Australia form ‘Without the fav’ or ‘winning distance’ markets. Additionally, you can lay a horse to lose in most of the above markets, something that cannot be done with any other Australian bookmaker. Although the ability to lay horses to lose is a massive attraction, the generous prices on offer are impossible to ignore. The majority of mainstream bookmakers have an over round in the region of 109% to 116%, or even bigger sometimes, on horse racing. As an example, in a 6 runner race held in the UK this month Bet365 Australia had an over round of 110%, whereas Betfair Australia’s was just 102%. Even after the usual 5% commission is deducted it is clear to see that if you are looking for the best odds on horse racing, Betfair Australia is the place to find them. Unfortunately, at this present moment, Betfair Australia do not offer live video streaming on any sporting events. However, if you enjoy betting on UK horse racing you can stream live radio commentary from Timeform via the Betfair Australia site. It isn’t quite the same as watching live, but at least you can hear how your selection is running in real time. Unlike a lot of their industry rivals, Betfair Australia are not known for their promotions or bonuses for existing customers. However, while promotions may be thin on the ground for members, betting resources are not. When you decide to open an account with Betfair Australia you will gain access to ‘The Hub’, an area where you can find all the tools you need to help you find those winning bets. The Hub is a section of the Betfair Australia site that can be accessed via the main menu bar at the top of the home page. In The Hub you will find a wealth of information and expert opinion on a variety of sports. These include tips for horse and greyhound racing, NRL, AFL, cricket, tennis, soccer and USA sports. You will also find form guides, stats and sectional times for horse racing, as well as all the latest results from Australia and from around the world. The Hub also contains interesting articles that explore different areas of various sports, and all this extra info goes towards making you a better informed bettor. The Hub is a great resource, and for many who choose Betfair Australia as their bookmaker it is one of the main reasons why they made that decision. Learn everything you need to know in the hub. * This only applies to all Australian and New Zealand currency credit cards. Other currencies may incur fees. ** NAB account holders depositing via internet banking may receive their funds within 1 hour if they have NAB SMS Security set up. When making a decision on what betting company is best for you, banking facilities are always something that should be considered carefully. 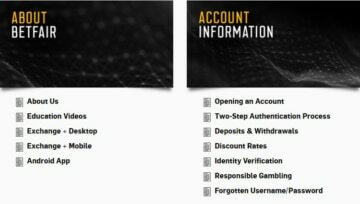 The ability to easily deposit or withdraw money improves the betting experience massively, and Betfair Australia have plenty of options in this area. The instant deposit methods available with Betfair Australia are via credit/debit card, PayPal and POLI. The non-instant deposit methods include BPAY, NAB and Credit Union or bank transfers. Betfair Australia cannot allow customers to withdraw money via their credit/debit cards. However, there are a number of different ways to extract your winnings. You can withdraw money via bank transfer, NAB, BPAY or Credit Union transfer. Skrill and Neteller will also work of course. 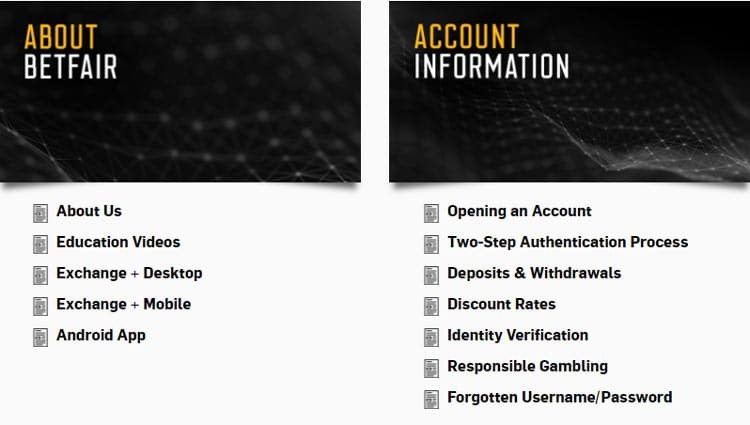 Before your Betfair Australia Account becomes fully active you must first verify it. If you do not verify your account you will be unable to withdraw funds. After 14 days if your account remains unverified it will be suspended. There are two ways in which to verify your account, electronically or with official proof of identification. When you open an account with Betfair Australia they attempt to verify your account electronically. Most new accounts are verified in this manner. If successful, you will be notified by email usually within 24 hours of signing up. If electronic verification is unsuccessful you will be notified by email. Take a photo of your Passport/Driving Licence/National ID card/Citizenship Certificate. Once your details are found to be correct, your account will be fully verified. When you bet with other Australian bookies it is always a case of you vs the house. However, with Betfair Australia it is different, as it is punter vs punter. In this case, the more you win the more Betfair Australia wins via commission, so it is no surprise that pay-out limits are thin on the ground. The only limits on pay-outs imposed by Betfair Australia are on multiple exchange bets. This is the only way you can bet against the house on this site, so Betfair Australia have protected themselves. The maximum pay-out on exchange multiples is a cool $1 million. Apart from that restriction, you can win as much as you want with Betfair Australia. Maximum pay-out on Exchange multiples is $1 million. No matter what business you are in, if you want success you must provide prompt, polite and efficient customer service. This is a basic for any business, and Betfair Australia have two avenues through which you can get in touch, phone and email. You can also book a live demonstration on any aspects of the exchange that you may find confusing via the telephone number listed below. Telephone: 1300 283 324 (24 hours/7 days). Email: [email protected] (monitored 24 hours/7 days). Is Betfair Australia A Bookmaker You Can Trust? If you are weighing up your options, one of the key questions to ask is whether this is a betting company you can trust. Betfair Australia has been around for some time, and its owners Crown Leisure are a well established company. Below are some of the safety measures put in place to protect Betfair Australia’s customers from fraud and security breaches. Betfair Australia is fully compliant with local data protection laws. Betfair Australia encrypts all data using the latest SSL technology certified by Thawte. This ensures that your personal information is kept safe during all financial transactions. We think it is vitally important that bookies look after their customers’ welfare, and Betfair Australia are big on responsible gambling. They want punters to enjoy their betting, and they have a number of features available that help to ensure that they do. If you think you are, or someone you care about is, losing more than you/they can afford, then the tools listed below could help. These include deposit limits (daily, weekly or monthly). Relevant links/contact details for gambling helplines. Betfair Australia allows access to ALL betting transactions over the lifetime of an account. As the above list illustrates, Betfair Australia are all about gambling responsibly. So, when it comes to the crunch, what makes Betfair Australia stand out from the crowd? Well, as we outlined above, Betfair Australia have plenty going for them, especially the very generous odds they have on offer across all sporting events. Not only can you back to win with Betfair, you can also lay to lose. Their web-app works well across all devices and uniquely allows in-play betting on horse racing. They cover a vast amount of sporting events, domestically and internationally, and though promotions are rare ‘The Hub’ more than makes up for that. Betfair Australia have adopted an admirable approach towards Responsible Gambling and that is a huge plus. As is their attitude towards fraud and security. One area that they could possibly improve on is their customer service, particularly the lack of a ‘Live Chat Help’ option. If you are a punter that places importance on value and maximising your winnings, then Betfair Australia could be the bookie for you. Betfair are the only betting exchange in Australia and the biggest worldwide. The company was founded in the UK in 2000 by Professional gambler Andrew Black and Entrepreneur Edward Wray, quickly becoming one of the biggest betting brands in the world. They launched in Australia from Tasmania in November 2005, employing 100 staff in Hobart and also having corporate headquarters in Melbourne. The other Australian states, concerned at the prospective loss of taxes and revenue, introduced a ban on the use of betting exchanges in Western Australia in January 2007. Betfair successfully claimed that this new law violated the Constitution of Australia. A more narrowly drafted ban was permitted, banning people in Western Australia from laying “lose bets” on events held in the state. As a betting exchange, Betfair operate in a different way to bookmakers with punters trading odds against one another. You can back or lay on a wide range of sports with Betfair taking a commission of between 2 and 5% from the winning bettor. By frequently offering up to 20% better odds compared to conventional bookmakers, the exchanges have revolutionised the betting industry.